Over the MLK long weekend, Zach and I ventured south to Las Vegas to visit my paternal grandmother and uncle. It had been quite a while since I’d seen either of them, and I felt guilty living a mere 6 hours away. You may have already gathered that Zach and I are not the gambling type from our trip to Macau last year, but even still, we did visit the Strip for a few hours. It’s definitely not our scene. 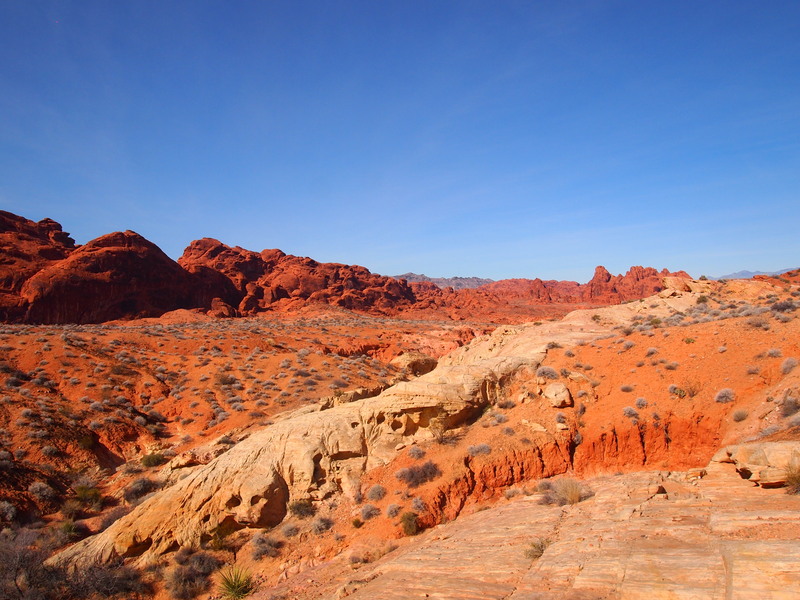 However, we did manage to find an antidote to the excess of Vegas: Valley of Fire State Park. 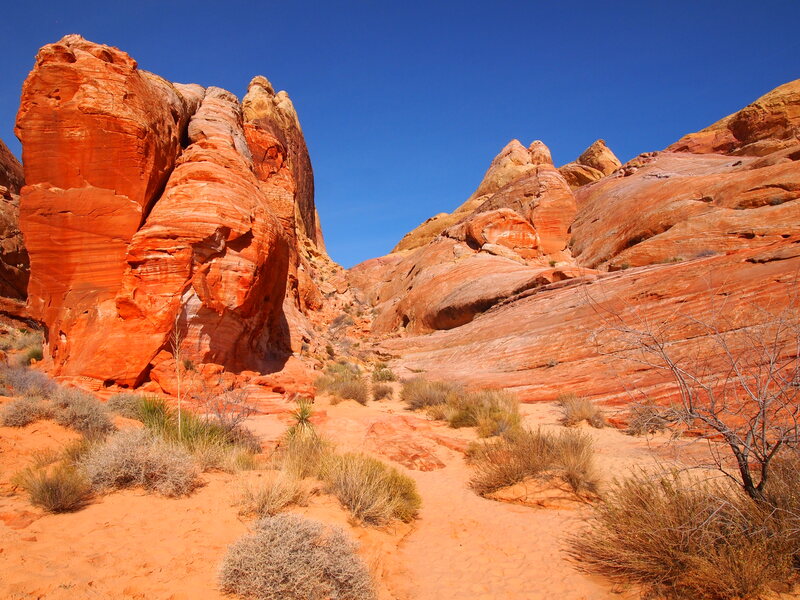 Valley of Fire SP is roughly 42,000 acres and contains an impressive array of geological wonders. 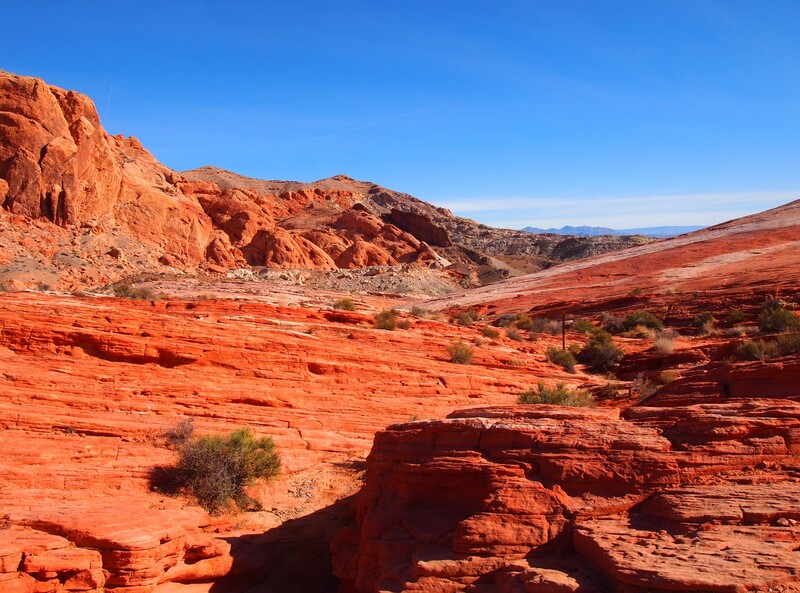 It’s located in the southwestern corner of Nevada near Lake Mead. 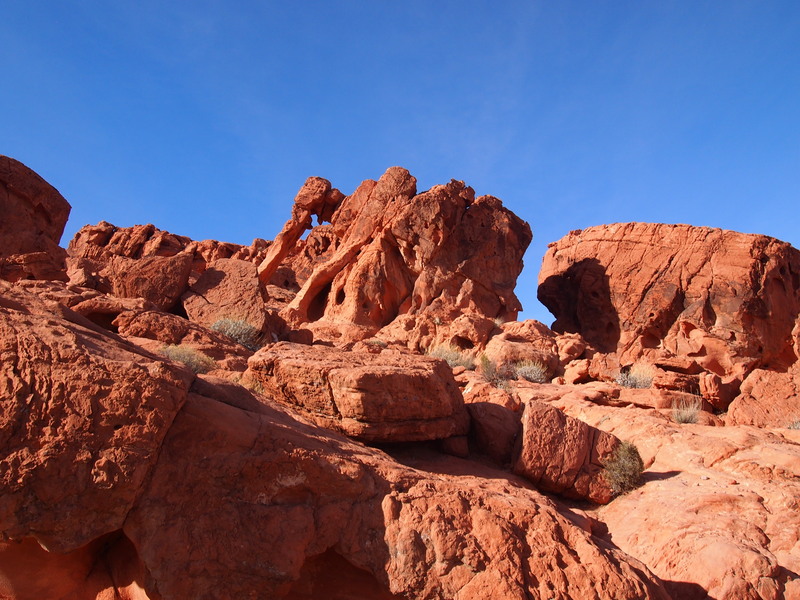 We entered the park through the west side and began with the scenic loop through red rock formations. 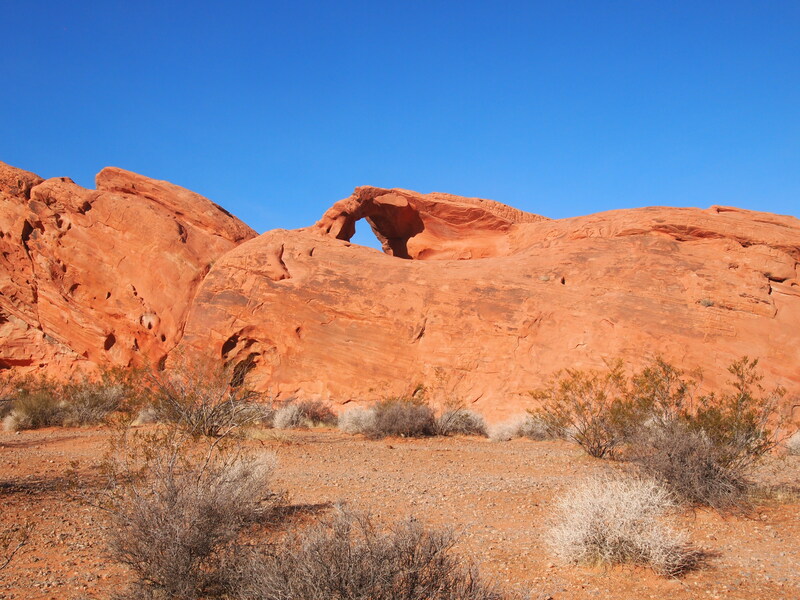 We pulled off to get a better look at Arch Rock, a small arched opening on top of a large red rock formation just off the road. A sign discouraged any climbing of the rock. 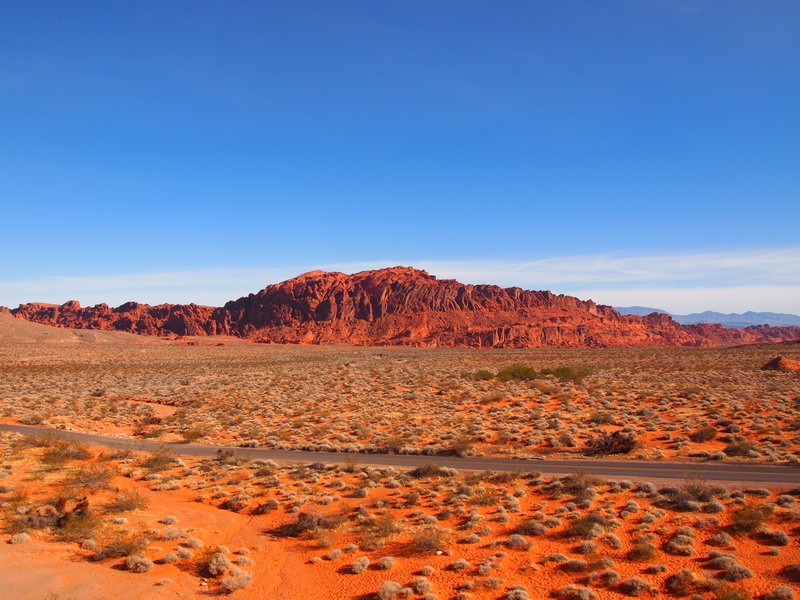 Nestled in the red rocks and within the scenic loop are the park’s two campgrounds. 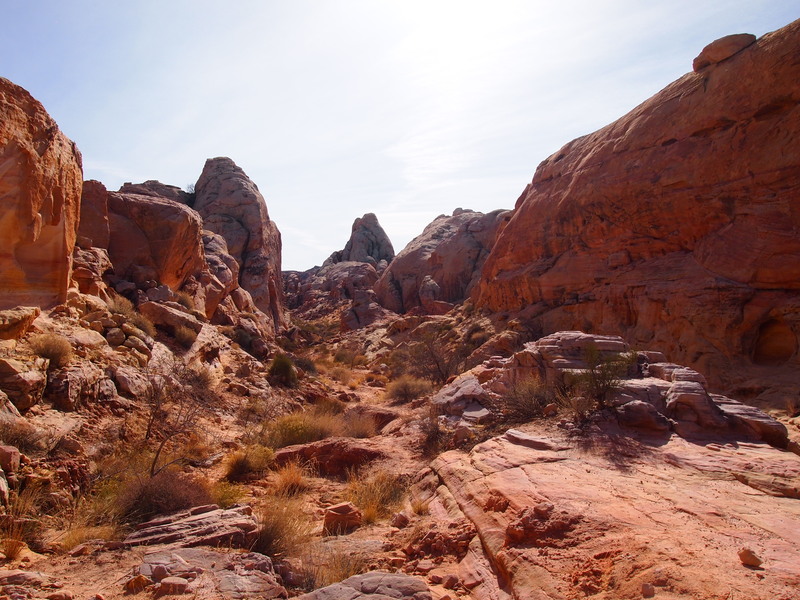 The first, Arch Rock Campground, was more primitive and reminded us of the campsites at City of Rocks in New Mexico. It would be a fun place to stay for a weekend or to break up a drive to LA. Just before the second campground is Atlatl Rock. 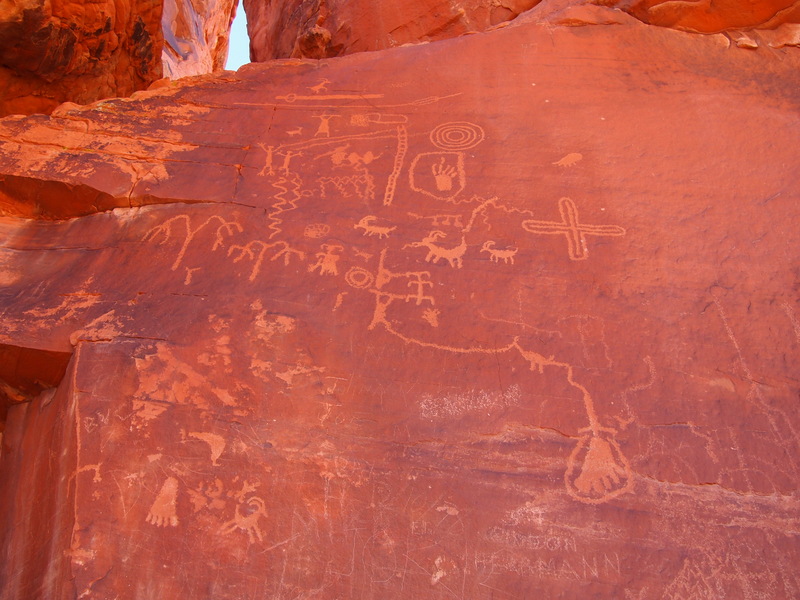 The rock has some excellent examples of petroglyphs mixed with a fair amount of vandalism. 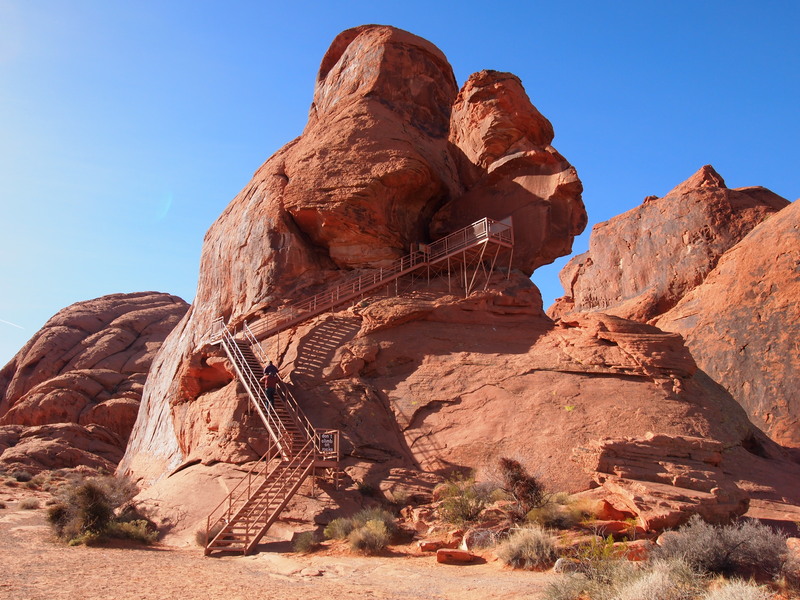 Originally there were steps carved into the sandstone which gave visitors access to the ledge – we could see them faintly leading up the side of the staircase – but now a metal staircase guides visitors to the main panel instead. 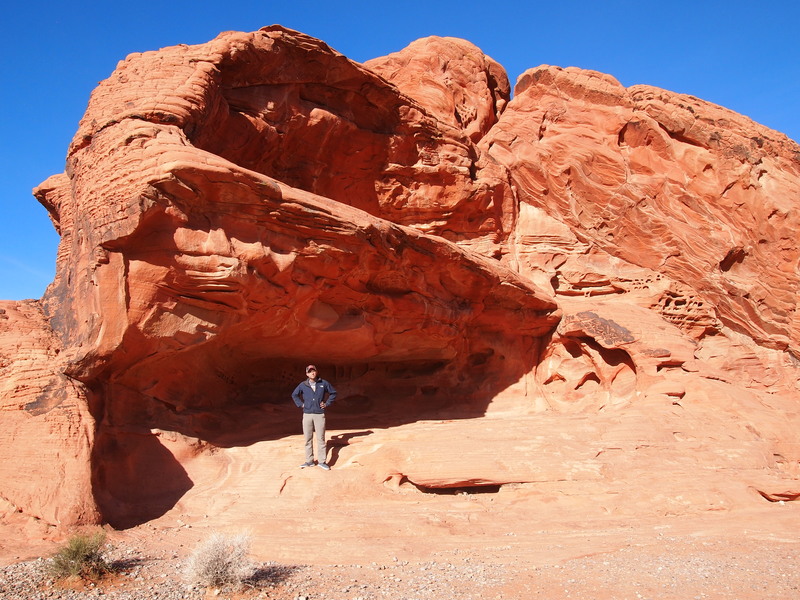 We left Atlatl Rock, made a pit stop at the Visitor Center, and continued to White Domes Road. 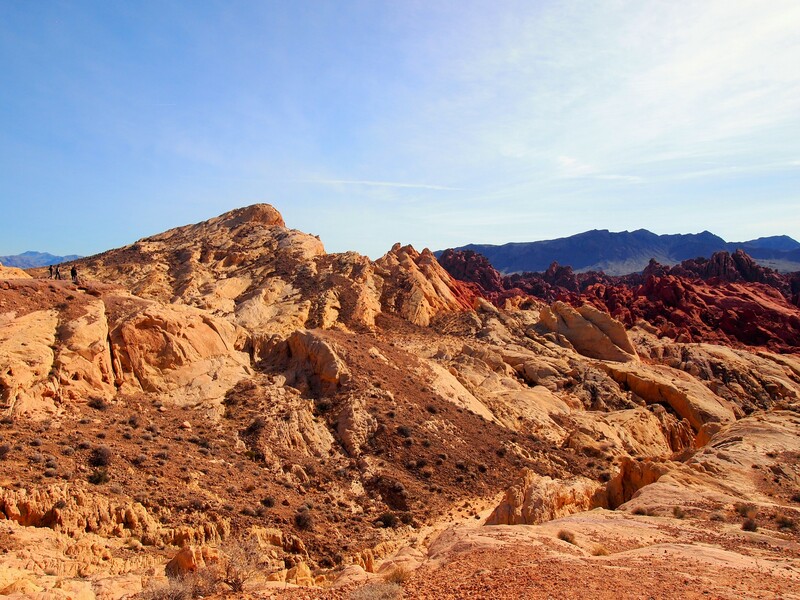 Driving up through a beautiful red rock canyon we passed a couple trails – Mouse’s Tank & Rainbow Vista – before the landscape opened up and provided an incredible panorama of the White Domes area. 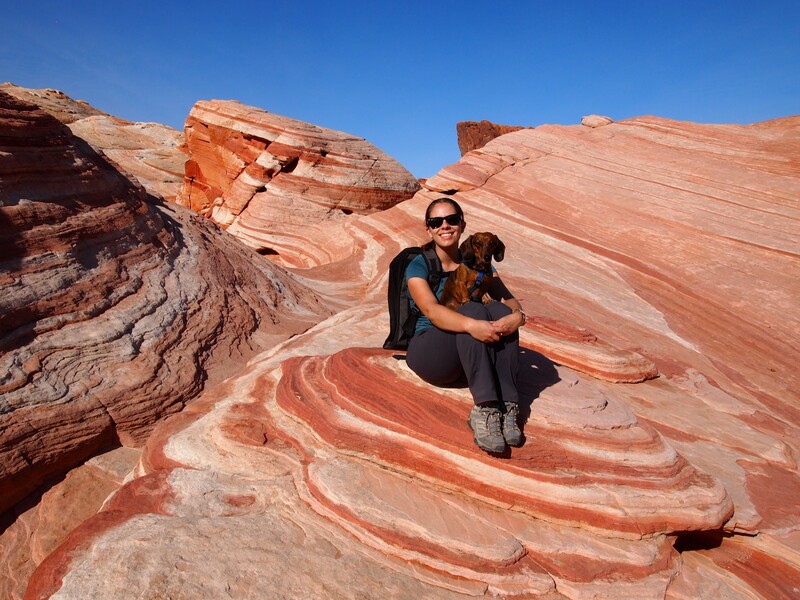 It reminded me a lot of the portion of the San Rafael Swell we visited back in October. 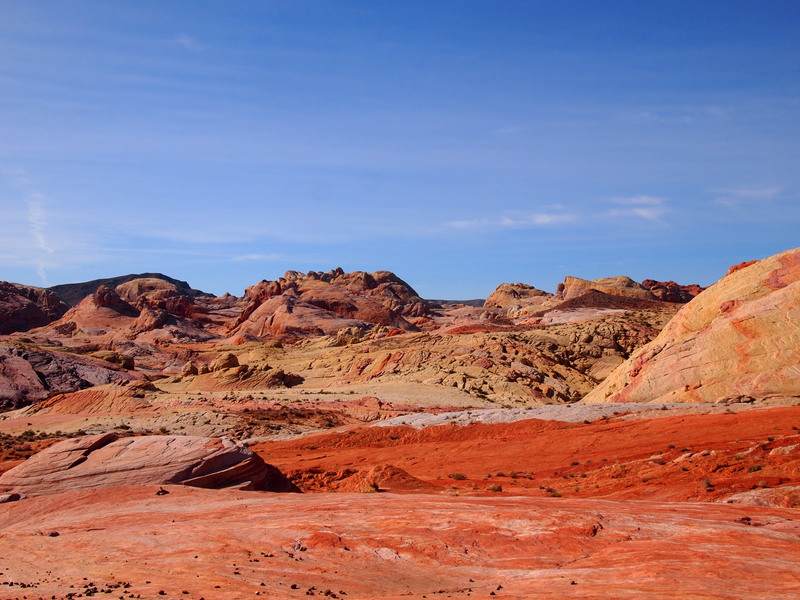 There was an abundance of color, and it was particularly striking against the cobalt sky. 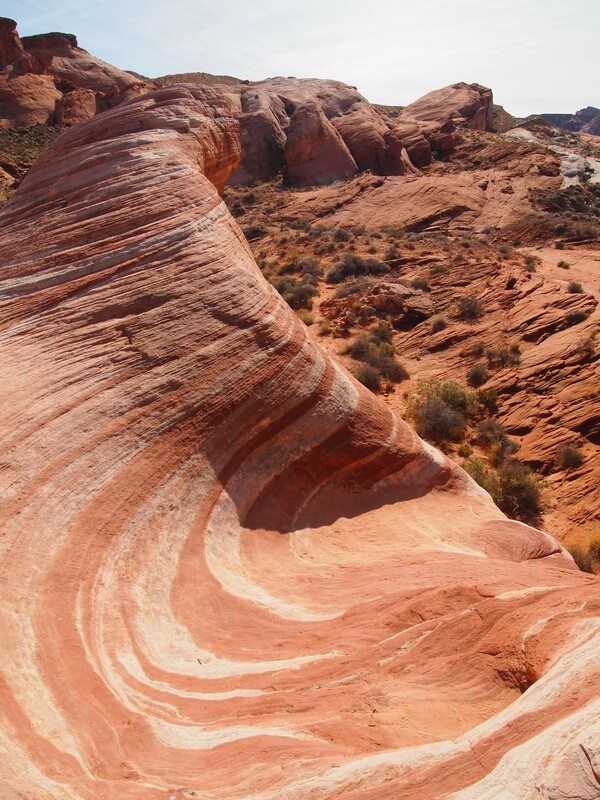 The first hike I wanted to do was a brief 1.5 mile (RT) trek to the Fire Wave. 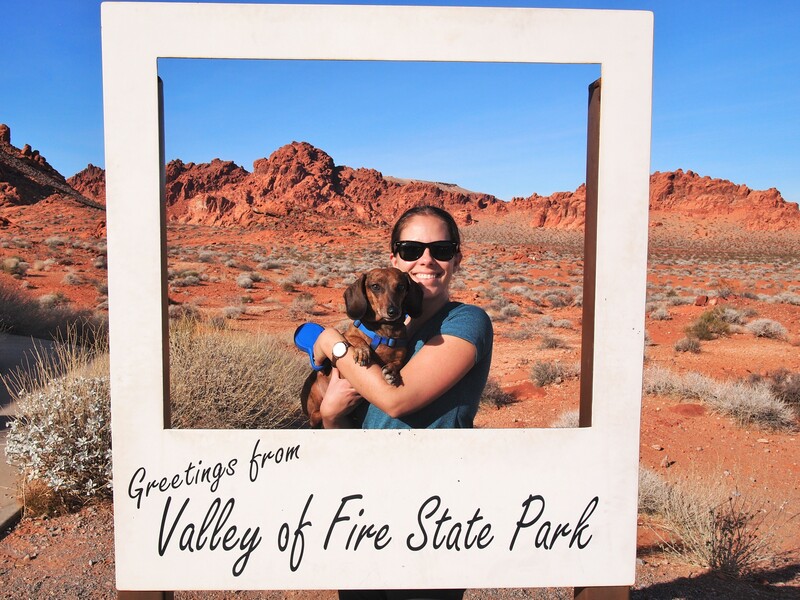 Truman was eager to get outside even though he’d worn himself out the previous day at Red Rock NRA. 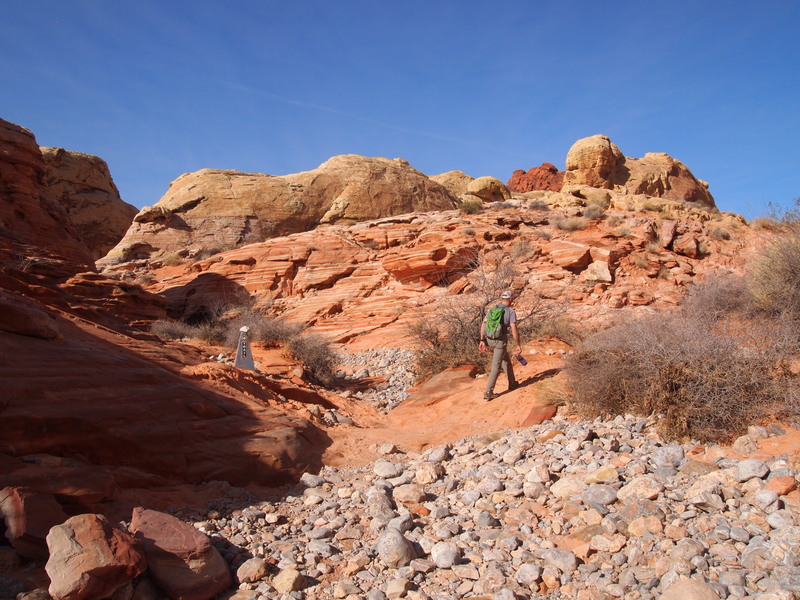 The trail is completely exposed, so it would be pretty rough in the summer. We had pleasant 60 degree weather but carried plenty of water and lathered on some sunscreen anyway. 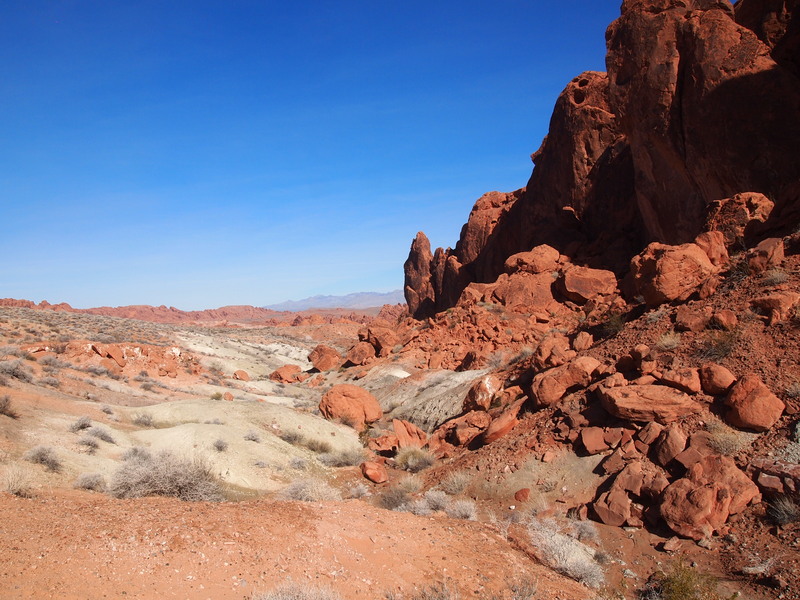 The trail began across the road from the parking area and immediately plunged us into deep sand. Thankfully this only lasted for the first tenth or so. 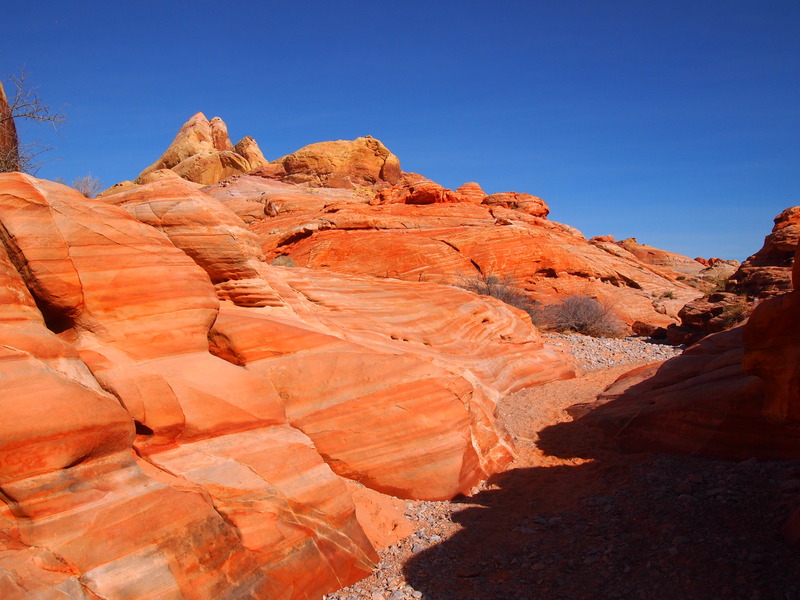 Eventually we found ourselves following a dry wash to an area with lots of multi-hued red slickrock. From there we followed the metal trail markers to the Fire Wave. Once we reached the final marker, I wandered around looking for the next one before Zach called out that I was at the Fire Wave already! I hadn’t even realized it. Somehow we timed it right and had the entire wave to ourselves. I later read in the park brochure that they don’t want people walking around on the wave area… oops. I never climb on arches if that makes up for this error! After the Fire Wave we drove to the end of White Domes Road and the trailhead for White Domes. 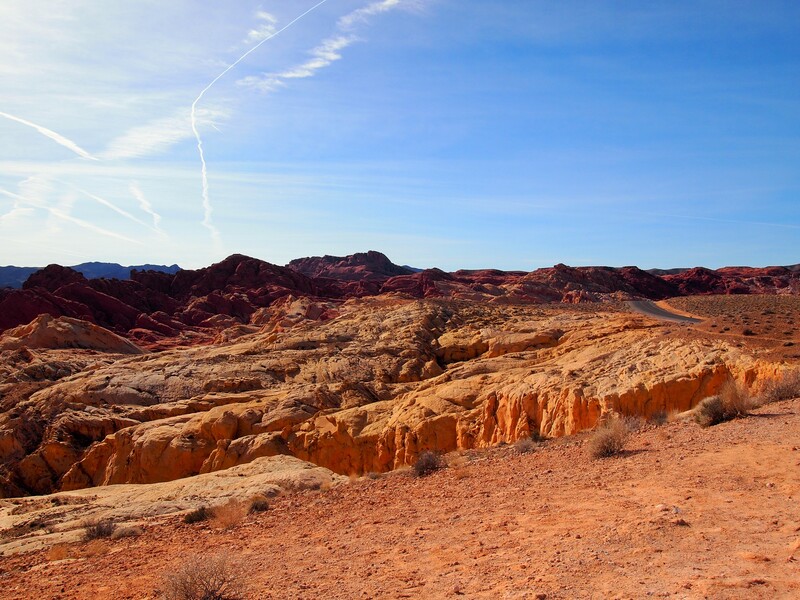 The trail is a short 1.25 mile loop with a sampling of features. We began at the top of the circle drive, though you could opt to begin at the other end of the loop, and it was an uphill slog in deep sand. 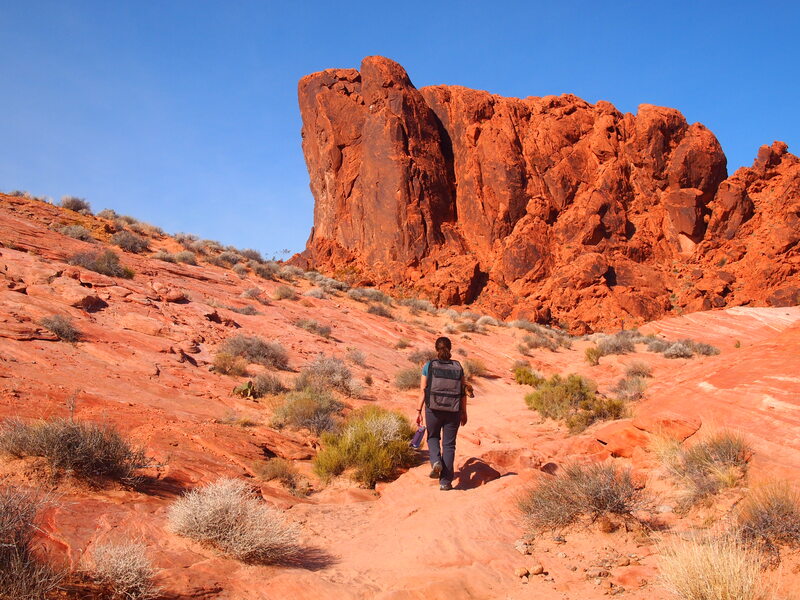 I let Truman walk initially but the trail quickly descended down a steep rocky slope with lots of large boulders; ultimately it was easier to carry him. 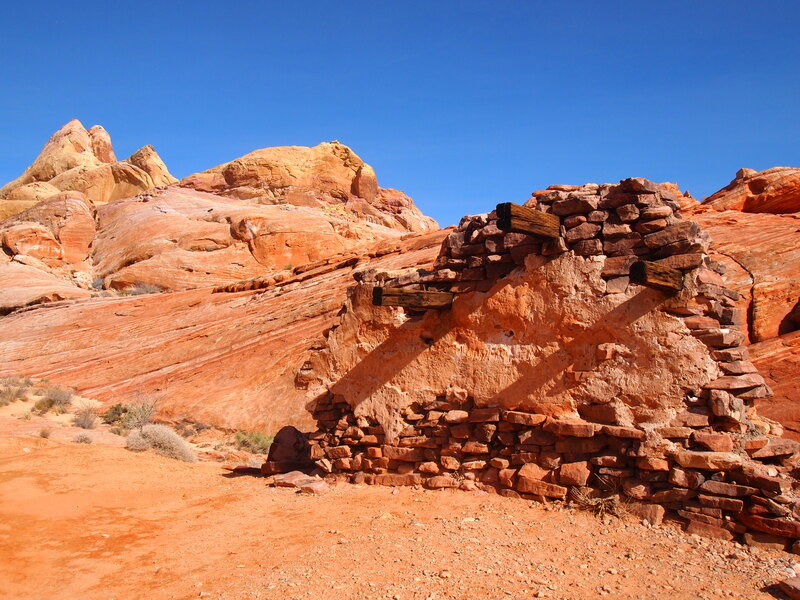 The trail then led us by the remnant of a set for the 1965 movie, The Professionals. 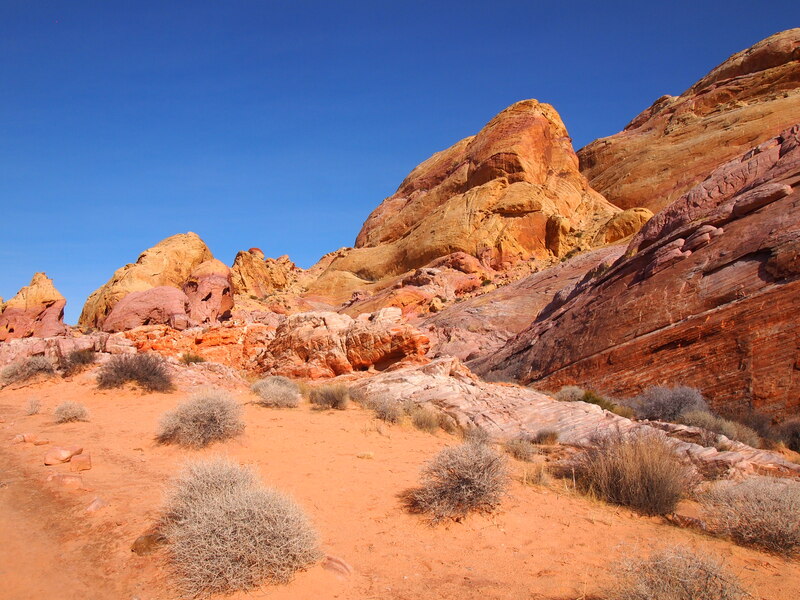 According to the placard, Valley of Fire has been used for many film shoots, commercials, and photography over the years though crews are no longer allowed to build sets. 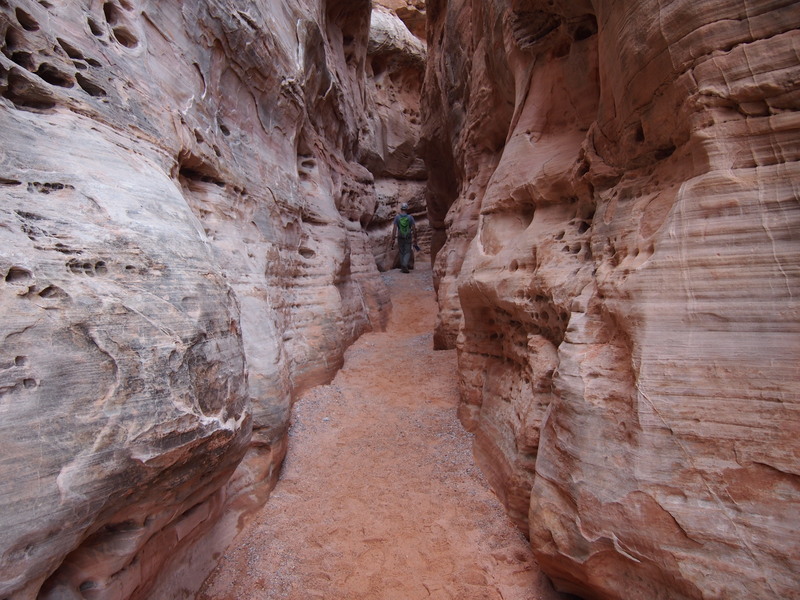 The trail dropped down into a wash and led us through a pretty but short slot canyon. It wasn’t much compared to the slots we’ve done over the past few months, but it was a nice change of scenery. 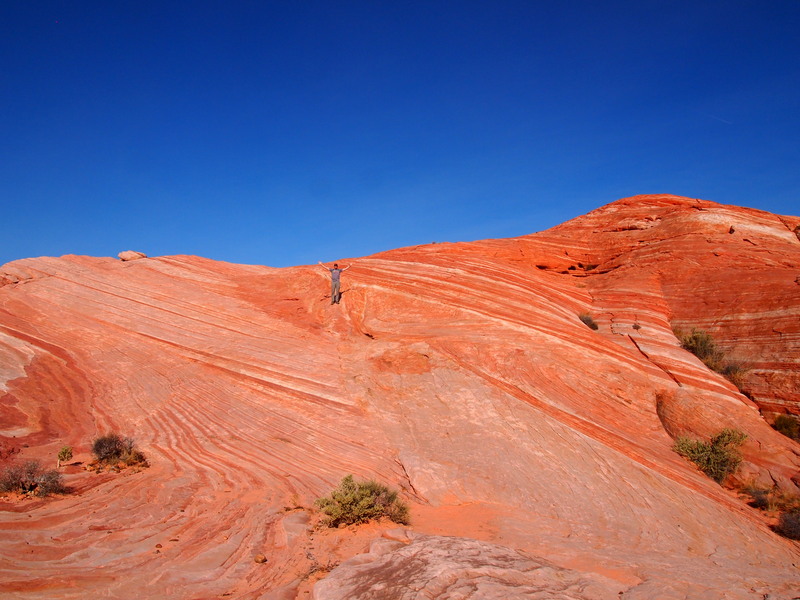 Before we knew it we were out of the slot and climbing out of the wash as the trail ascended through sand, burro bush, and slickrock. In the last section of the loop the sandstone was brilliantly diverse in color, and we had sweeping views once we’d gained some more elevation. 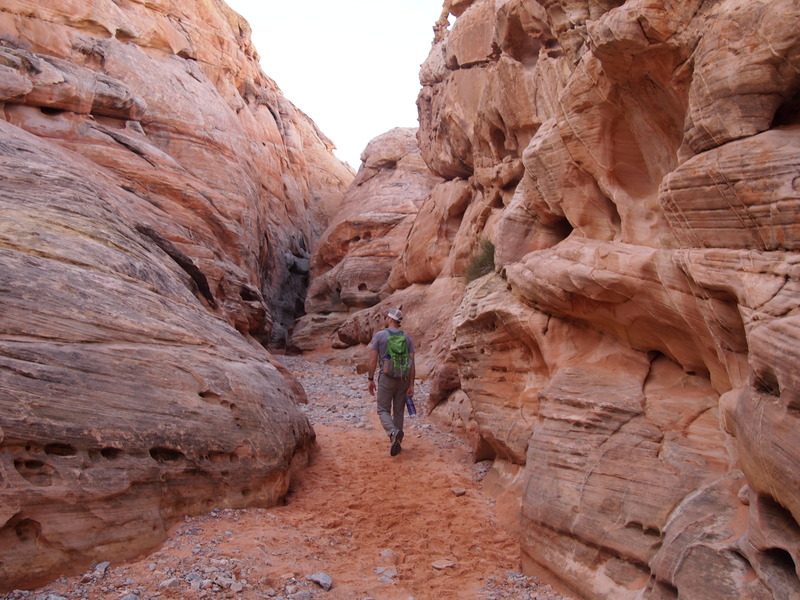 Though quite brief, this trail was really pretty and offered a nice array of geologic features. 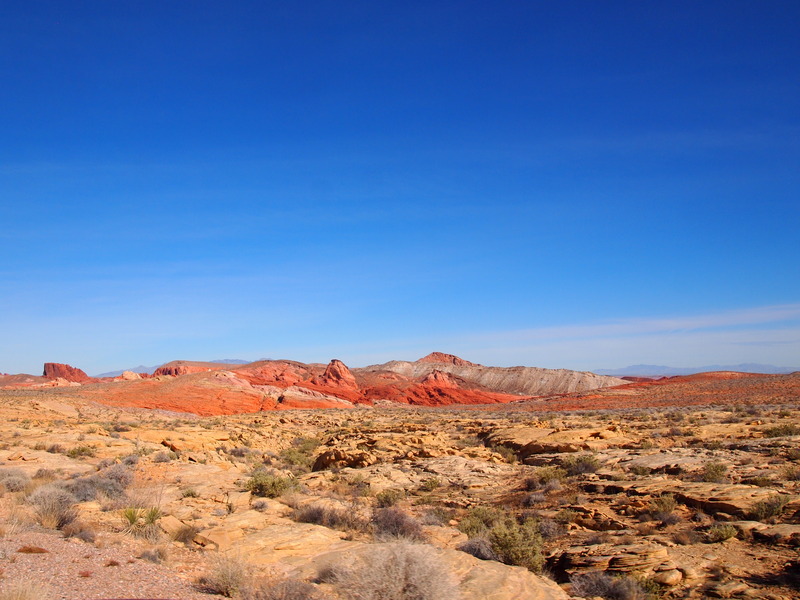 After we left White Domes, we made the short side trip to Fire Canyon and Silica Dome – a different time of day would have afforded a better view of Fire Canyon. 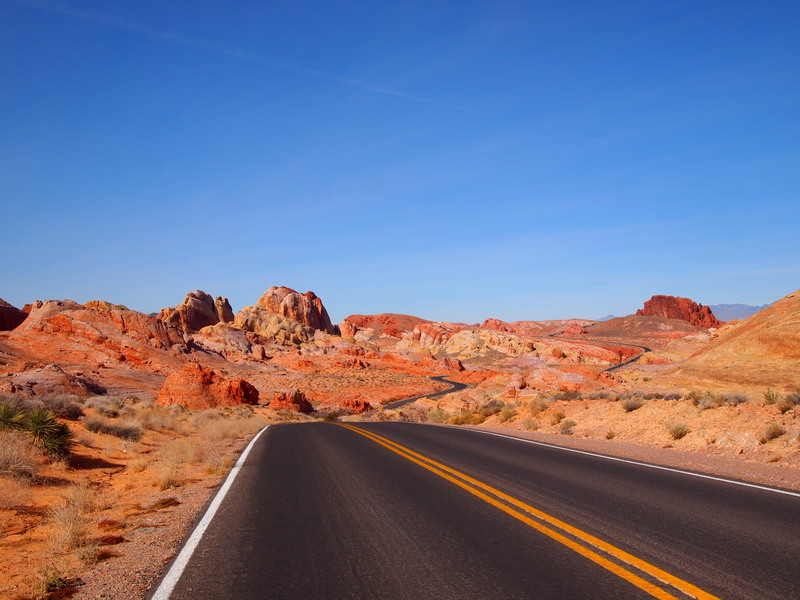 Then we drove back down White Domes Road to the main park road and headed east toward the other entrance/exit. We made one final stop at Elephant Rock before leaving the park. 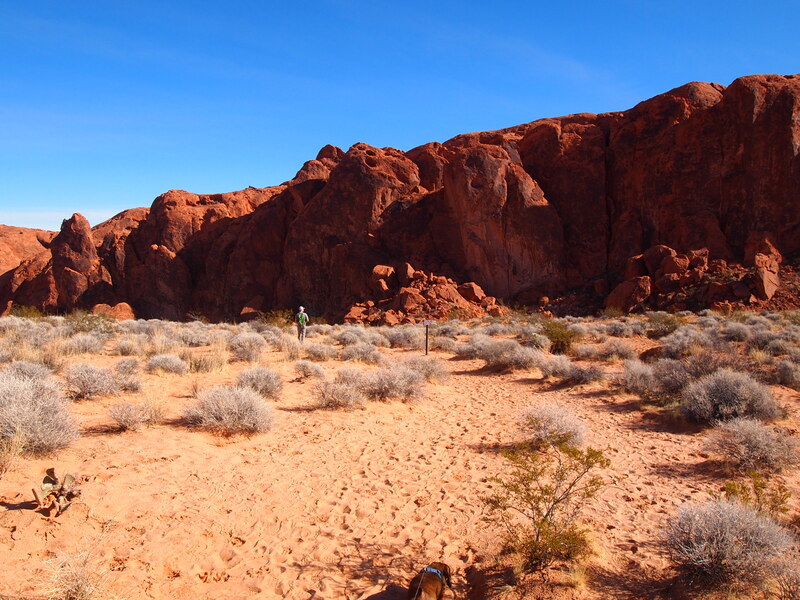 It was easy to spot from the road, but we opted to park at the east entrance gate and walk the short trail to the rock itself. It really does look like an elephant! 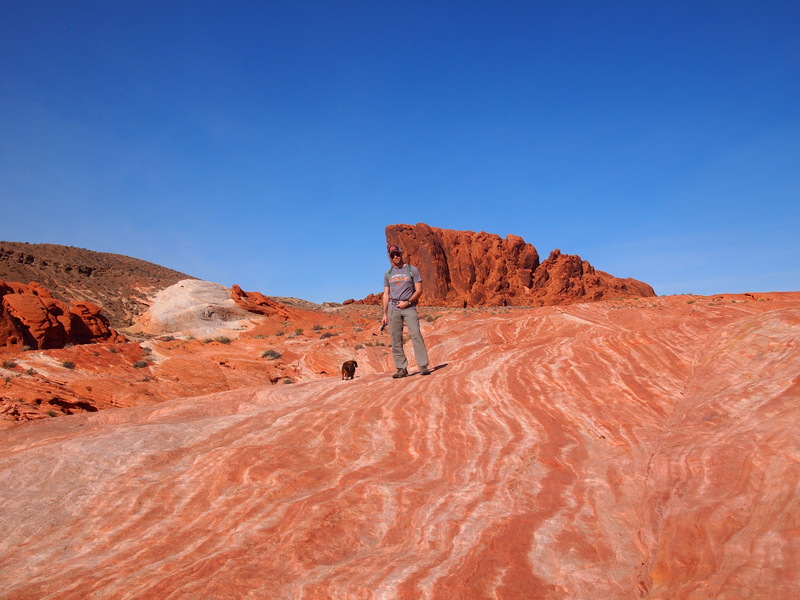 Valley of Fire SP was a wonderful detour. We thoroughly enjoyed the relative solitude of the park, even on a holiday. 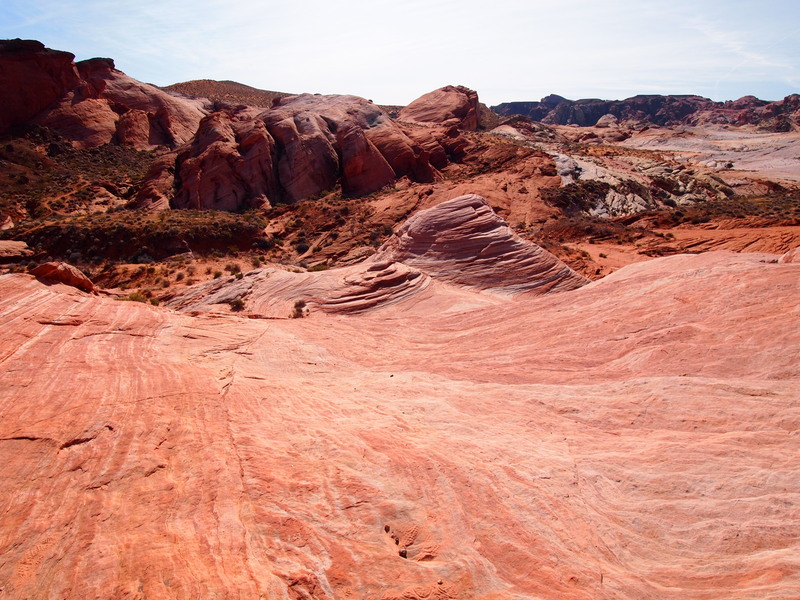 Similar to Goblin Valley SP in Utah, we found Valley of Fire more appealing. 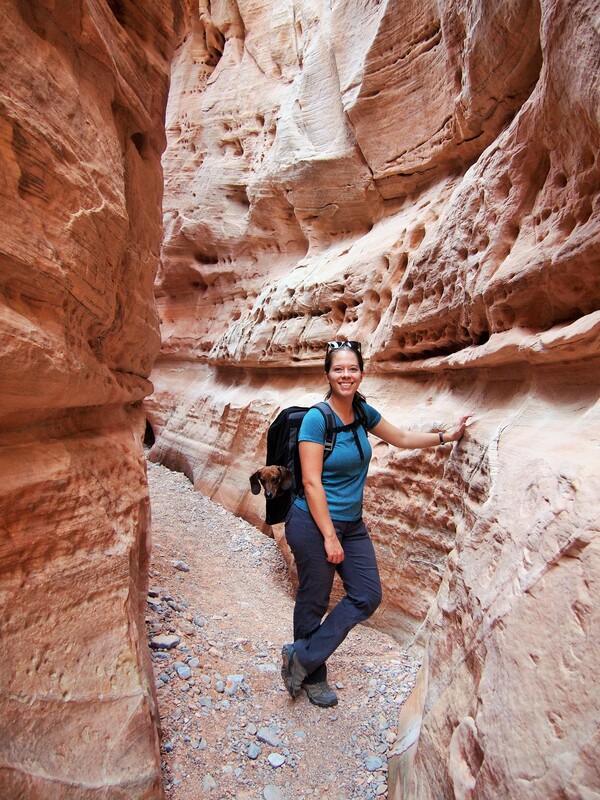 It had a more diverse landscape, more hiking trails and overlooks, and a wider range of activities. It was well worth the stop!